Looking for beachfront or bayfront homes for sale in Wildwood NJ? Want a place to take the family for a great summer stay? Or maybe you are looking for an affordable beach home in the 300-500k range to live in year around? Then search no longer because Wildwood is for you. Wildwood is four communities, specifically the Borough of Wildwood Crest, City of Wildwood, Borough of West Wildwood, and the City of North Wildwood. The Wildwoods have plenty of things to do revolving around the beach and bay for all ages. This is your chance to own a part of the beach. 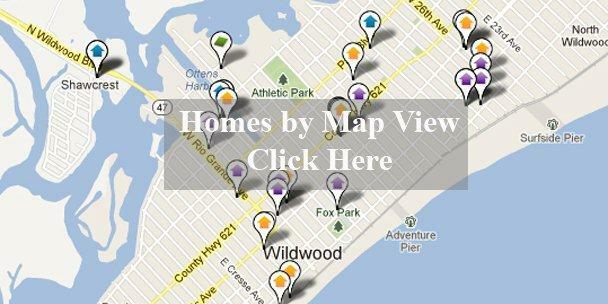 Wildwood NJ homes for sale is our specialty. Below are just a few of the newest homes to hit the market. Our website provides you the ability to view all active homes for sale in Ocean City, Strathmere, Sea Isle City, Avalon, Stone Harbor, Wildwood, and Cape May. The site is easy to use for all your property search needs. Featuring the best foreclosures, bank owned homes, land, and homes for sale at the Jersey Shore. Contact us! Sign up to the right to receive free daily email alerts as they hit the market. Start planning to buy your beach home today and find out what makes Wildwood such a popular destination for thousands of vacationers every summer. Contact us to view a home today or inquire about a properties rental income history! Click below for some of the latest homes for sale in Wildwood NJ, including all new construction in Wildwood, Wildwood NJ Short Sales and Wildwood, NJ Foreclosures. Bookmark this site and sign up now for full access and to stay current on the latest new listings in Wildwood. Click below for all homes for sale in Wildwood!